John Oster of Morral Companies (left) accepts the 2019 Distinguished Service Award from Mark Sunderman, chairman of the Nutrient Stewardship Council, during the Ohio Certified Crop Adviser annual meeting. The Nutrient Stewardship Council has announce John Oster of Morral Companies, LLC as the recipient of the 2019 Distinguished Service Award. The award is presented to an individual who has provided outstanding service and commitment to the 4R Nutrient Stewardship Certification Program. 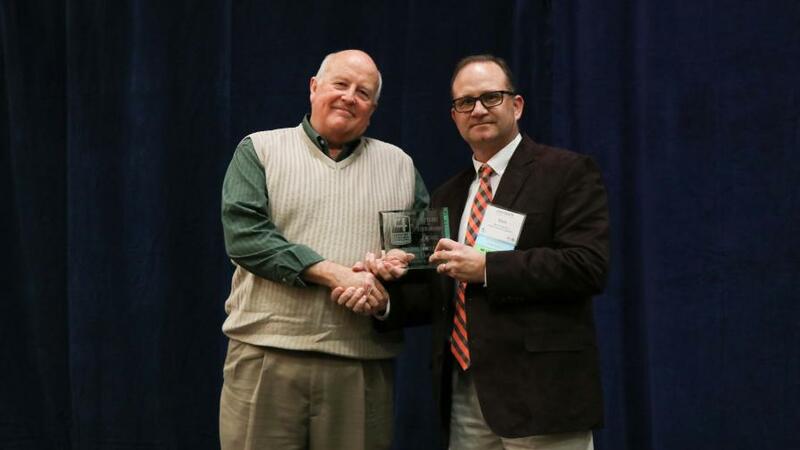 The award was presented to Oster on Jan. 31 during the Ohio Certified Crop Adviser annual meeting held at the 2019 Ohio AgriBusiness Association Industry Conference in Dublin, OH. Mark Sunderman, chairman of the Nutrient Stewardship Council, introduced Oster and presented the award. Oster was accompanied by his wife, Kay. Oster has been one the industry’s leading advocates for the 4R Nutrient Stewardship Certification Program since its inception, dating back to 2012 planning meetings. Oster served three years on the Nutrient Stewardship Council, governing body of the certification program, including a term as vice-chair. Oster’s realistic approach to the agriculture industry’s voluntary nutrient management efforts has helped provide invaluable guidance for the program’s success and progression. Oster joined Morral Companies in the fall of 2010, specializing in wholesale and national account sales for the US and Canada. He previously held the position of Director of Facilities for Yara North America, Agronomy Division Sales Manager for Growmark, Wholesale Sales Manager for Agway and D. W. Dickey and Regional Consumer Sales Manager for W. R. Grace & Company. Oster has invested in the agriculture industry and his countless volunteer hours keeps him busy in his spare time. Most recently, John served as the 2017-2018 Agricultural Retailers Association chairman.